The first quilting *PING*: Must. Use. ALL. The. Colours. 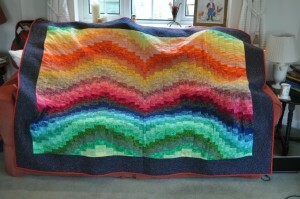 Ooo, Bargello? Perfect! 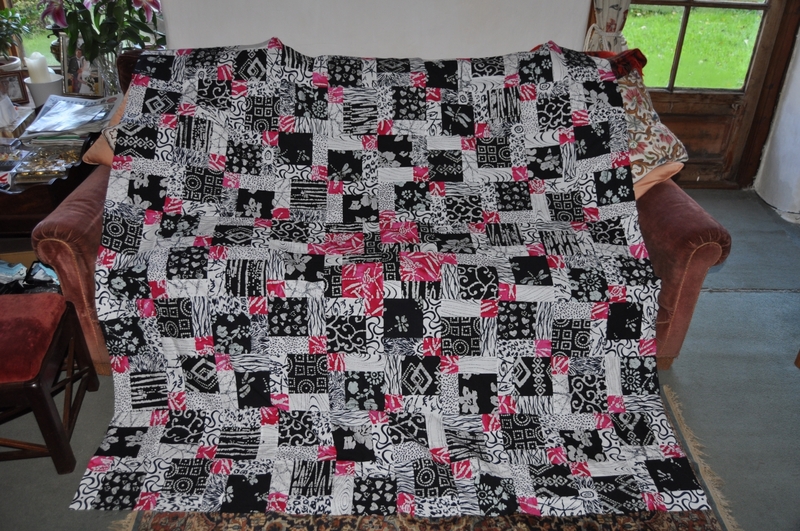 It seems that there’s a big debate in the quilting blog world over modern versus traditional styles, as though it were some black/white, either/or, “there can be only ONE!” situation instead of the spectrum that it clearly is. 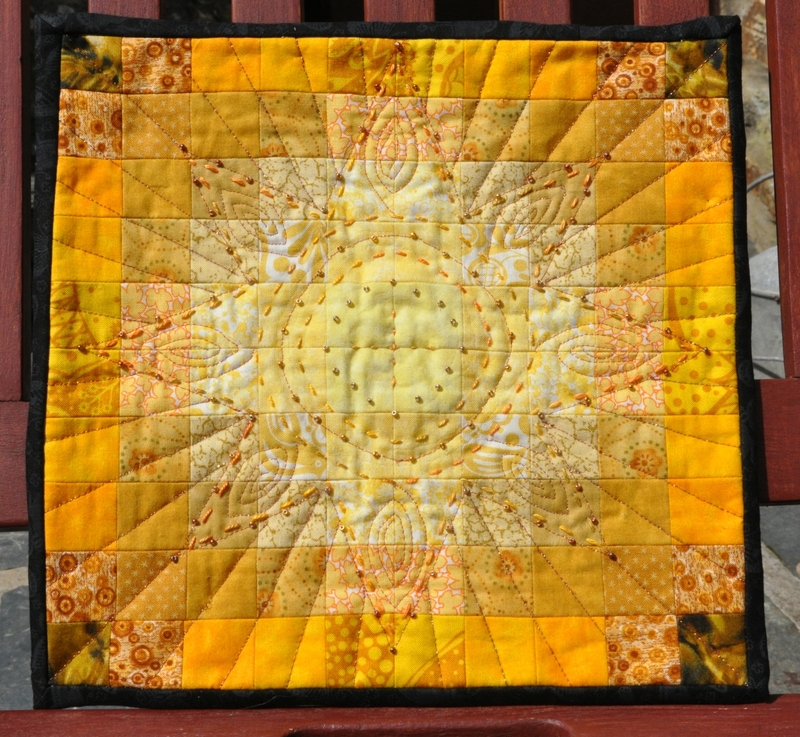 It’s a discussion that I can only view as an outsider because I’m not very (read: at all) connected to the quilting blogosphere and I’m comparatively new to quilting (less than two years at time of writing). How could I possibly define my style (or lack thereof) to the rest of the world when I’m still working to develop it? This is not to say that I’m not inspired by the work of others. Although I’m pretty anonymous in the grand scheme of things, a real face-in-the-crowd, I do read other blogs if I see things that appeal to me and they’re certainly not all quilting blogs (inspiration comes from the strangest places). Sometimes I comment. 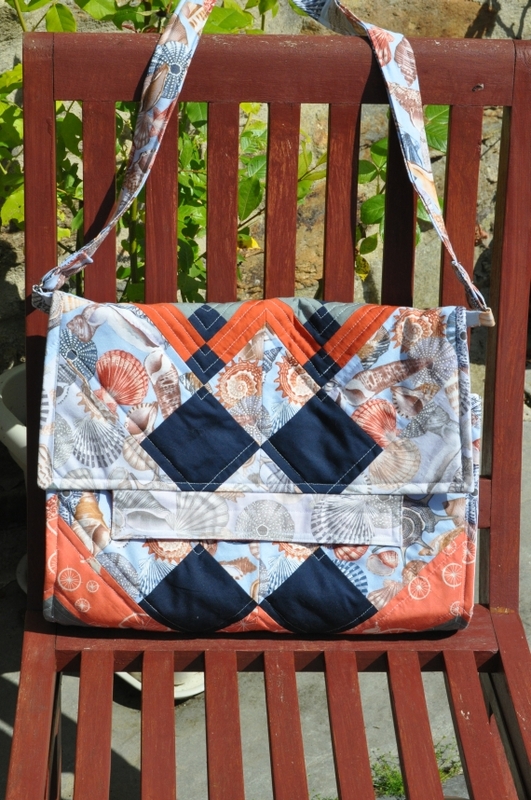 I try to credit ideas and inspiration wherever possible, and I’m drawn to many aspects and styles of quilting and patchwork, as well as several other crafts. So I’m not going to say a whole bunch about the application of labels to the general concept of quilting because other people already did that, probably better than I can right now. Instead, I’m going to take the challenge set by Pretty Bobbins at face value and talk about my quilting process, such as it is, and also some of the uncertainty I feel about quilting and calling myself a quilter (I can’t really talk about connecting with other quilters because I haven’t, really, except for the lovely ladies at Quilt Club). My MO for anything creative seems to be “pile a lot of stuff up and see what falls out”, and consequently my quilting is driven by many things, but most of all it’s driven by what I’ve started to think of as the *PING* moment – the instant when all those fragmented ideas and materials and concepts gel in my mind and I have to get on and make it real – or at least try. I should probably note that I’m a hybrid of very organised and very chaotic. One thing that appeals to me about quilting is the precision of it – I like my points to match and my seams to be consistent, it makes me happy (blame my scientist side! ); my quilting group know me to be a bit of a perfectionist. But the way I do things probably looks pretty chaotic from the outside – my shiny new craft room has piles of stuff everywhere that span a gamut of interests in addition to quilting and at any given time I have a number of projects on the go, which never seems to stop me buying more fabric “just because”. My quilting group also know me to be one of the most likely to show up to a session clutching a new project and looking a smidge sheepish at having started yet another new thing. A *PING* happened when I found the pink batik and again when I saw a D9P pattern online. While waiting for the *PING* to happen, I tend to accrete things (thoughts, materials, quilt recipients) so that I’m prepared when it does happen. It’s not a very efficient process, but I’m getting more practiced at directing and fuelling it and the feeling when it happens is brilliant. Sometimes there has to be more than one *PING* moment in the making of a project, especially a big one. Ultimately, I tend to focus on what appeals to me and what might appeal to the recipient, given that currently a lot of what I’m making is destined as gifts for others. When the *PING* happens, I try to grab the image in my mind and recreate it in the real world, but I’m still new enough at this hobby that even that is not always straightforward and the end result may or may not be exactly what I envisioned. Usually I like what I make (and make what I like! ), but not always. In that case I try to analyse what did and didn’t work and what I could/should do differently next time. Not quite what I saw in my head. I’m having a lot of fun experimenting with different patterns and there’s many I still haven’t had a chance to try. I just have to balance the desire to try ALL the things with actually finishing the things I’ve started. I’m getting better at this though – quilting has the advantage of needing crucial design choices throughout almost the entire process, which helps keep me interested up to the end. And then there’s the pleasure of seeing something I’ve made and the fun of giving a loved one something unique and personal to them. My biggest fear, I think, is having to quantify and justify how much I like quilting before I’ve even had a chance to get to know it properly. It’s been preying on my mind a lot recently because of all the ups and downs I’ve had with our motley crew of sewing machines. I’m finally in a position, thanks to a small inheritance from my great-aunt (who was a very arty-crafty lady herself), of being able to afford a Really Good Sewing Machine, but not only am I in a bit of a dither over trying to choose a machine (So variety! Much confuse! 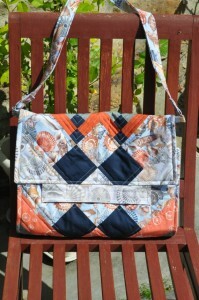 ), I’m also trying to decide if my ability level and interest are worth a Really Good Sewing Machine. I know what I’m like – I’m easily distracted by new shiny things and I worry that quilting will be a flash in the pan interest for me. I hope it won’t and I’m enjoying it very much so far, but it is a concern. Can I justify spending £££ on an expensive piece of kit for a hobby I might lose interest in? Additionally, as I’ve become more proficient and confident with my quilting and made a wider variety of things, I’ve found myself under pressure from some friends and family to consider quilting from a business perspective (mum in particular has a vexing habit of showing me magazine articles about crafters that have “made it big”, all of which inevitably sidestep the hundreds and thousands of skilled crafters who didn’t make it big). And that’s all very flattering and sweet, but firstly I don’t consider my friends and family to be the most objective of critics, love them though I do, and secondly I’ve observed that most successful businesses at this sort of scale are very focussed and well defined – they usually have a distinctive “look” or angle that appeals to others. I am not focussed or well defined, or even particularly original; I see myself as very much a novice still and that won’t change overnight. As someone who works as a freelancer, I already have an insight into the challenges of time management and the difficulties of separating work and life when both take place in the same environment; quilting is a refreshing change from editing, but would I need something to be a refreshing change from quilting if it were my job? I’m aware that it is a lot of hard work to turn a hobby into a business (something else that those chirpily optimistic articles tend to gloss over) and I wonder if I love quilting enough for that, or whether making it a job would leach away my enjoyment. I worry that I might run out of ideas or find myself unable to create things that others would want to buy. I like making one-of-a-kind items that “fit” the person they’re for and wonder if having to make a large number of essentially identical items would bore and annoy me, without even adding the pressure of then having to convince people to buy them at a fair price. These rather negative thoughts cycle around with my initial fears over how much I enjoy my hobby and the need to decide how much it’s worth to me (because spending a lot on a sewing machine might be easier to justify if sewing were at least in part a source of income). It’s all very stressful, and hobbies shouldn’t be stressful, right? Not this kind of stressful, anyway. I ask myself why I worry about these issues that are not my issues, except that I have to consider them every time someone makes that thoughtless, “Ooo, couldn’t you sell these?” comment. I also get a bit resentful when I’m asked that other annoying question, “But what’s it for?”, as though just creating something attractive is not sufficient, there must always be some higher purpose (in fact I do usually have something or someone in mind when I make things, but sometimes it would be nice to, y’know, have the freedom to just make something for the hell of it, for the sheer joy of having a skill and applying it). I don’t want to feel pressured over something I currently enjoy doing and am still learning a lot about, but sometimes it feels that way. I’m trying to stem these fears with some perspective – yes, I have a lot of interests (probably too many interests) and I like trying ALL the things, but there are some constants even for me (travel and computers spring to mind). I tell myself that a Really Good Sewing Machine will be an investment that will make my hobby more fun and that sewing is something I have enjoyed on and off for many years. And despite what mum thinks, I don’t have to become quilting’s answer to Cath Kidston overnight (which is bizarrely what she seems to expect). Of course I can make something just because I want to make it, if I so desire and I have time between editing manuscripts and making gifts. But I definitely can’t bring myself to fret over “modern” or “traditional” labels while I’m still trying to figure out how and if the label of “quilter” even applies to me.